Sometimes it’s a mystery what Mark Ronson is thinking as he’s putting music together. After having a rather successful run with the early rock and doo-wop sound, he’s gathered a smattering of pop singers, rappers, and rockstars to complete his third offering, Record Collection. A record featuring Ghostface Killah and Alex Greenwald of Phantom Planet singing on the same track shouldn’t work, but does. Ronson has created an album that has great beats, gifted vocal performances, and is as energetic as it is daring. These disparate wires tangle together to create a sound that shows why hip hop, pop, and rock can coexist on the same album. Nearly every track is a triumph in its own right for channeling so many artists onto one record. 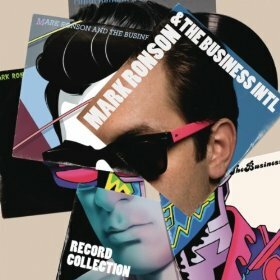 Mark Ronson deserves credit for not making this a vanity project though, as D’Angelo, Boy George, Jake Shears of Scissor Sisters, and members of Duran Duran all take their turn performing on this album. Ronson incorporates friends from the English music scene as well, including Kyle Falconer of The View, Nick Hodgson of Kaiser Chiefs, ex-Pipette Rose Elinor Dougall, and ex-Dirty Pretty Thing Anthony Rossomando. Additionally, Ronson also takes his turn behind the mic, proving that he is not only a gifted instrumentalist, but a worthy singer as well. Fusing ‘80s beats with a modern flavor, Ronson proves that he has his finger on the pulse of what’s current and what is going to continue to set trends. Record Collection is a fresh, exciting offering in the vein of UNKLE, The Roots, and DJ Shadow. Certainly this songsmith has put his vast contact book to good use on this album, and it’s a good sign that there is more to come from a man who will not be limited to simply being the producer who propels others forward.